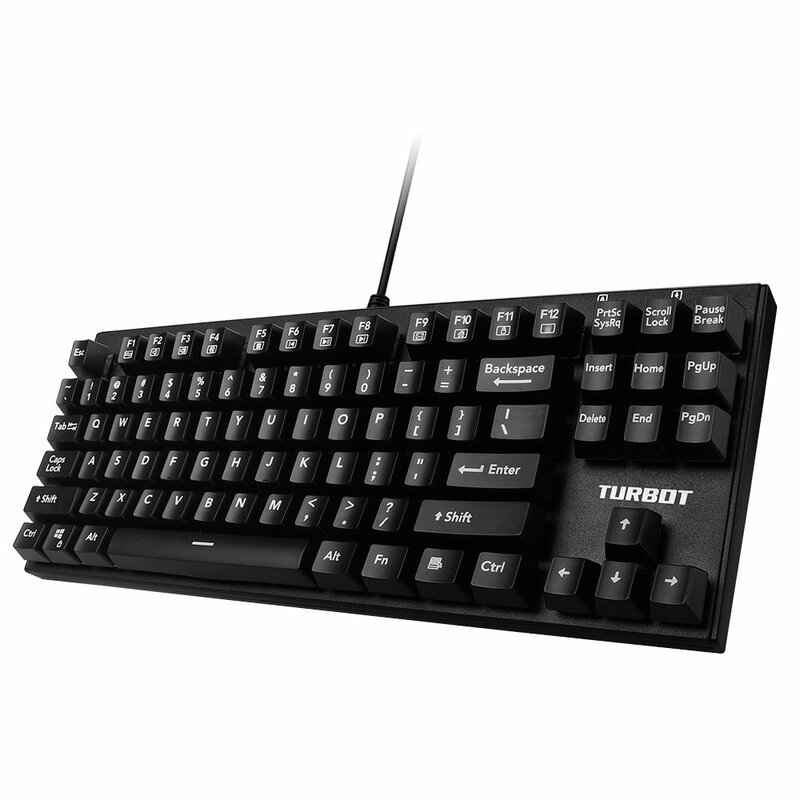 Home › Electronics › Turbot Water-Resistant Anti-Ghosting 87-Key Wired Mechanical Gaming Keyboard ..
Turbot Water-Resistant Anti-Ghosting 87-Key Wired Mechanical Gaming Keyboard .. High-Performance Gaming Keys 87 anti-ghosting, tactile keys for feedback you can feel, so every keystroketranslates directly into accurate gameplay, even when multiple keys arepressed. Ergonomic Design, Easy to Operate Ergonomic design with the laser-etched, textured keycaps enable enhanced gripand feel. It's textured to provide just the right amount of grip to keep yourhands in place and improve your gaming performance by giving you speed,responsiveness and long-lasting comfort like never before. Strong Impact Resistance &Extreme; Durability Made of metal panel with matte-finish texture and laser-etched keycaps, Turbotgame keyboard is sturdy and robust for rugged durability with an 50 millionkeystroke span you need for hours of gaming. Anti-skid Design Two rubberized holders under the mechanical keyboards to prevent it from slip. Wide Compatibility Compatible with Windows10, Windows 8, Windows 7, Mac OS X, Windows XP, WindowsVISTA. Warranty The desktop gaming keyboard includes a 45 days money back & 18-month warranty.